Membrane proteins with seven transmembrane helices (7TM) are found in all kingdoms of life. They are involved in signaling (GPCRs) and, in the case of the retinal-binding subgroup, also include light-driven ion pumps or light-gated ion channels. Retinal-binding proteins showcase how evolutionarily distinct proteins fulfill vastly different functions despite sharing a common molecular architecture. During the last funding period, almost all methods available within the CRC 807 such as cryo-EM, solid-state NMR, solution-state NMR, time-resolved optical and infrared spectroscopy, as well as electrophysiological approaches have been applied to the 7TM projects, often in a combined and collaborative fashion, which resulted in important contributions to the field. Within the next funding period, we will focus on KR2 and channelrhodopsin-2 (ChR2) as important examples of microbial rhodopsins and we will link our studies to GPCRs via mammalian rhodopsin towards the endothelin receptor system. The use and optimization of microbial rhodopsins as optogenetic tools will be further explored. 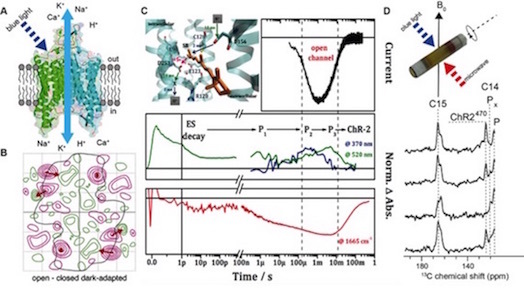 A) ChR2 is a dimeric, light-gated ion channel. The link between photocycle and channel opening/closing is of key importance. B) ChR2 undergoes significant helix reorientations upon illumination as revealed by cryo-EM. C) Channel conductivity (top), time-resolved UV/VIS (middle), and mid-IR spectroscopy (bottom) upon illumination illustrates the correlation between channel activity and structural changes in the photocycle. D) DNP-MAS NMR spectra of 13C-14-15-retinal within ChR2 trapped in different photo-states offers the possibility to probe the coupling between chromophore and protein.